This MotoGP season has been one for the record books. It’s had insanely close races, tons of passing, and the overall points standing has been close all year. The only thing it’s been missing is drama - at least until now. Last week’s race, at Phillip Island, was one of if not the best race in the last decade or so - with four riders battling for first place until the end of the last lap. In the end, Marquez pulled off the win after passing Lorenzo in the second to last turn. If we have another race like Phillip Island we have to speak with him, with Marquez, because during the race it was more difficult to understand, but after when I saw the race later it was very clear that he play with us very much.... Because mainly I think that his target is not just to win the race, but also help Lorenzo to go far and try to take more points on me. So I think that from Phillip Island it is very clear that Jorge has a new supporter. That is Marc. He later went on to say that Marquez had the potential to pull away once at the front and that, if he had, it would have been a different race. Interesting to see the guy in the overall points lead conceding that Marquez was so fast at Phillip Island. Of course no. Of course I did my race and in fact if I want to help Lorenzo I wouldn’t pass him on the last lap, not push to the limit and not take the risk. I don’t why they say (this). 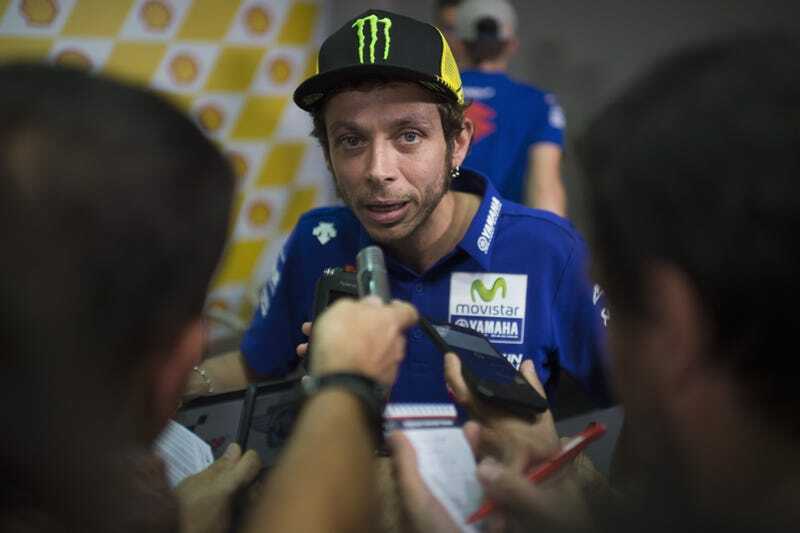 The fun doesn’t stop here, with Rossi continuing to accuse Marquez of helping Lorenzo after the press conference when journalists pressed him for more info, which was published on MotoGP.com. Q: Do you think that Marquez helped out Lorenzo at Phillip Island? Q: So why did he eventually also overtake Lorenzo? Q: Why do you think he did this? Q: Is it something that motivates you or makes you angry? Q: Because he used to idolize you, did you think this wouldn’t happen? Q: Was it better with Biaggi, because he at least made his feelings clear? Q: Did this all begin in Laguna Seca (2013)? This adds even more excitement onto what is sure to be a huge race this weekend. I didn’t think I could get any more excited for Malaysia, but this took it to 11. It’s an exceptionally tight track and, with this sort of animosity in the air, could get really intense.